Let’s start with what “Functional” means. You might have already heard about Functional Medicine. Functional Medicine addresses the underlying causes of dis-ease engaging both patient and practitioner in a therapeutic partnership. By shifting the traditional disease-centered focus of medical practice to a more patient-centered approach, Functional Medicine addresses the whole person, not just an isolated set of symptoms. Functional medicine practitioners are NOT medical doctors. We are more like “health detectives” and we educate our clients on how they can get healthy with mindful lifestyle choices. We use a toolkit of over 400 resources to investigate the hidden stressors and underlying causes of dysfunction, then use that information to identify healing opportunities. 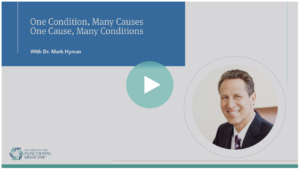 Check out this video by Mark Hyman, MD, describing why one condition can have many different causes and how one cause can lead to many different conditions. Intake questionnaire, Functional Medicine Matrix, Timeline of health symptoms, Symptoms Questionnaire and many lifestyle questionnaires including: sleep, stress, toxicity, nutrition, exercise and self-care. We may use either functional lab testing or bio-energetic screening to investigate the hidden stressors and underlying causes of dysfunction, then use that information to identify healing opportunities. Even though we look at functional test results or screening information, we don’t diagnose dis-ease or treat symptoms. Symptoms are not “normal”, they’re your body’s way of telling you something is imbalanced. They give us clues into the causal factors of what’s throwing your organs and body out of whack. We then devise a personalized lifestyle protocol based on the 7 Pillars of health (which stands for Diet, Rest, Exercise, Stress Reduction and Supplements) to rebuild the body and promote healing. Over time on the functional medicine prescription, we’re looking to see your symptoms decrease as you move towards your optimum health and vitality. Stress reduction techniques such as meditation, visualisation, and mindfulness. Incorporating physical activity into your day. Creating more joy and fun in your life. Letting go of old habits, beliefs and behaviours which are no longer serving you. Your journey to wellness will be just that—a journey. A journey doesn’t happen over night, in two weeks, or even a month, however with every day, you should start to feel better, better and better. You current health is a reflection of your whole life so far, it took many many years to feel sick, become exhausted, toxic, gain weight, and create bad habits—that it also takes time, patience and dedication to refocus, rebuild and reverse old habits to new healthier ones and as your perspective shifts over time and you start to feel great, you’ll also find it hard to imagine ever going back to unhealthy habits. You are committed to making the lifestyle changes necessary to flourish and are ready to take charge of your own health. You fully understand that neither I, nor a drug, supplement, therapy or modality don’t heal you, YOU HEAL YOU. You understand this is a process, that change does not happen over night and you must invest your time to get well. You are willing to invest in yourself financially to make lasting improvements. You’re willing to look at all aspects of your life and how they contribute to your overall well being. You visualise and dream of a vibrant life where symptoms or limitations holding you back from enjoying living a purposeful life you love. You want to continue masking symptoms with medications for the rest of your life—both over-the-counter and prescription. You look to other people to “fix” you and are not interested in getting educated on how you can take charge of your health. You don’t believe in the concept of “food as medicine” but would rather “count calories”. You’re not willing to examine other aspects of your life including stress, emotions or adverse events or trauma in relation to your overall well being. You don’t understand it takes an investment of commitment, time and money to get educated and get well. We’ll start out with a timeline of your health history and go over your intake forms to discuss your main concerns. We’ll move forward with appropriate functional or bioenergetic screening as needed, to uncover hidden contributors to your symptoms and seek healing opportunities to help you on your journey to vibrant health. We’ll go over a customised self-care lifestyle prescription that over time will help these symptoms diminish or disappear. We’ll put in place a review process to help you stay on track and accountable. I recommend at least every four to six weeks until your are symptoms free for at least one month. You should know, we can’t guarantee results as we don’t control the outcomes. We educate you on how to tap into your body’s innate healing ability to promote health and wellness. However, it’s up to you to take action and follow the advice, and I’m here to guide you throughout the process.